When learning French, you often want to figure out how to translate from English to French words. Keep reading for tips on how to translate, what to watch out for, and tips on buying the best dictionaries and classroom helps! There are a slew of good French translators online such as Yahoo's Babel Fish and Google Translator. In general, if you want to look up a word here or there, these are good options. However, there are a few pitfalls to using an online translator like this. Often times a translator will give you the exact equivalent of the words written as opposed to giving you a more colloquial and accepted phrase. This can result in a French that sounds broken or foolish. The reality is, while a translator can be helfpul -- it's never as helpful as your brain! A second pitfall is that if you're always looking to have things directly translated for you, you deny yourself the opportunity to really learn how to think in the language. Once you learn how to think in a foreign language, it's no longer necessary to go from English to French words but instead you can simply 'speak'. Adult: You want a cookie? Toddler: Yes, I want a cookie. While it arguably takes more than one repetition for a toddler to master certain concepts, adults still learn language the same way. So for example, if you want something in a store and don't know how to ask, you may say: J'ai besoin de ça. While pointing your finger at what you want. A clerk is likely to respond: "Oh--tu a besoin du lait? And now you know that the milk you're asking for is le lait'' and you also have learned how to ask for it correctly. This is a natural approach to learning any language. Not only that, but by trial and error, you are more likely to learn the colloquialisms that signal a fluent speaker. 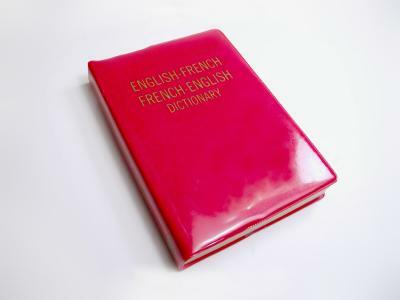 La Rousse Advanced English to French Dictionary -- This is the Cadillac of French dictionaries. What makes a dictionary advanced and the best of the best? For one thing, it has other sections besides just words. There is a section on conjugating verbs, and another that gives numeric conversions -- particularly important for the American speaker who is not used to the metric system. In addition, you always want to get a dictionary that has multiple entries for certain words that are used in many phrases. If you're writing, you will most likely want a French verb conjugator. One of the best brands on the market is Bescherelle. They offer a complete guide to translating 12,000 verbs--pretty much anything you want to say is going to be in this book! Pierre Books - -One of the ways you can improve your spoken French is to read in French. If you're just starting out, you may well want to begin with familiar stories and stories like Barbar and Tintin. The pictures will help you bring meaning to the text even if you're not sure exactly what is happening. Of course it never hurts to listen to something in French. Almost all cable stations have news in French -- it varies from location to location. However, listening to the news is a great way to practice listen to French that is spoken correctly and articulately. Don't discredit the many websites that are in French. The internet makes the world a smaller place and you as a student can take advantage of many, many websites that are written for Francophones.